If you're going to pick any location to visit, the personal favourite of your tour guide is a good place to start! The 'area that has it all' is packed with a mesmerising kaleidoscope of sights and sounds. You will experience them all, as James expertly guides you through the historical fishing villages and stunning coves around the southernmost point on the UK Mainland. We are able to accommodate groups of more than seven, simply get in touch to discuss prices and itineraries. Can I include this tour in a multi-day tour? Yes! All of our tours are fully customisable and can be included into a multi-day tour. Included: Free admission to selected attractions • Your knowledgeable guide James • Pick up and drop off to your hotel in Devon or Cornwall. While food is not included, James has a network of recommendations including cosy pubs or traditional cafes. We have an option for everyone. The choice is yours! One of the joys of the Southern coast is the possibility of experiencing four seasons in one day so remember to bring suitable clothing. Don't forget... We offer you the chance to delve into your family’s ancestry and history. Click here to find out about incorporating our Family History & Genealogy Tour into your trip. All our luxury guided day tours can be tailored to your personal wishes. Our bespoke itineraries can be crafted to ensure you get to visit the places you want when you want. Simply let James know where you’re interested in heading and he’ll do the rest! Click below to get an idea of a trip we would create for you. Having collected you from your accommodation, we’ll head straight for the coast and Mullion Cove. A climb up the hill will give you the perfect vantage point of the wild, rocky coastline and a stunning sea view over Mount’s Bay and out to Mullion Island. 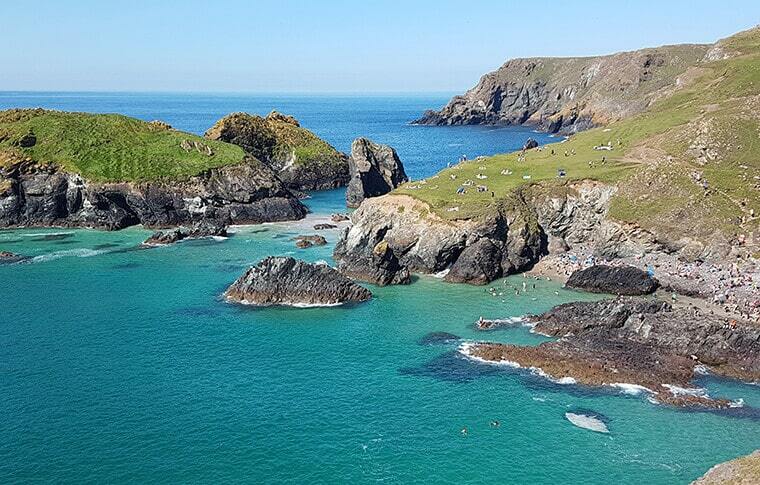 We’ll continue our journey along the coast towards Kynance Cove, one of the most beautiful stretches of coastline in the South West. The view is punctuated by the glorious white sandy beach and the sharply contrasting red and green serpentine rock. Now would be the ideal time to get the camera out and capture one of the most photographed locations in all of Cornwall! Lizard Point is the southernmost point of England’s mainland and it here that we venture next. With it’s dramatic cliffs, shaped over the years by the crashing waves of the Atlantic, Lizard Point is the classic backdrop of authentic Cornish coastal scenery. Perhaps the highlight though, is the Lizard Point Lighthouse. Built in 1751, the lighthouse is still guiding visiting ships away from the dangers of this stunning but treacherous coastline to this day. Next up, we set course for Cadgwith, an idyllic Cornish fishing village seemingly forgotten by the 21st century. Let the overwhelming feeling of nostalgia wash over you as you marvel at the beautifully rugged scenery and authentic local colour on show. This is where we will stop for lunch (not included), with a selection of local pubs and cafes to choose from. After lunch, we leave Cadgwith to navigate our way around the small streams and creeks that make up Helford River. Peaceful and picturesque, the river also boasts a wealth of marine wildlife and is home to a wide variety of fascinating bird species. The final leg of the tour is Falmouth, a town steeped in fascinating maritime heritage and one of the South West’s leading cultural destinations. With its eclectic blend of history and modern creativity, Falmouth is a hub of activity and the ideal way to end the day. 16.30: Depart for hotel, arriving back approximately 17.30pm. James was able to personalize our experience and show us all the things we knew to see and suggesting more. Knowledgeable and personable, James made this an unforgetable experience.